SoftPlanet makes it possible for everyone to get free Fat32Formatter download directly from our servers. There is no registration needed for downloading. 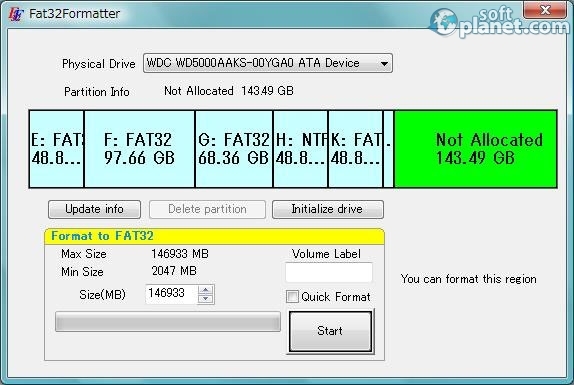 Fat32Formatter is a free software application, intended to format drives larger than 32 GB using the FAT32 file system. It comes with an intuitive and user-friendly interface. It doesn't require installation. Fat32Formatter is freeware and made by TOKIWA. It is very intuitive, thanks to the tooltips, which are all around. Fat32Formatter allows you to set and delete partitions as well. It doesn't need any installation, just decompress the archive and run it. Because of that there are no registry entries. Fat32Formatter is a free and portable software application, which breaks the limitation of 32 GB FAT32 formatting. It comes with a simple and very intuitive interface. It is full of tooltips, which will help you if you need to. Our security scan shows that Fat32Formatter is clean from viruses. The current version of Fat32Formatter has been scanned by our system, which contains 46 different anti-virus algorithms. That ensures that Fat32Formatter 1.1 is 100% safe for your computer.